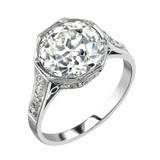 Today on the radio, Gary Craig and his morning team talked about new vs. vintage/estate sale engagement rings and opened the phones for comments as to whether or not it was appropriate for a bride to be presented with a ring that was pre-owned or not designed specifically for her. Although I knew my answer immediately, I increased the volume and anxiously awaited for them to take the calls. In the meantime, I thought about the last 80+ weddings I have attended in the last five years either as coordinator or guest and thought futher about all the rings the brides have worn. They have really been across the board: family heirloom, designed from scratch, designed to copy a designer ring, chosen directly from the case as is, setting chosen from case or on-line, but with different stone, and some have not even worn an engagement ring at all. A lover of all tangible items with history, my personal answer was, "Absolutely!" My sister in law, in particular, has a gorgeous vintage Harry Winston setting, and mystery behind the ring made me love it even more. And who could forget the simple engagement ring Annie Banks and Bryan MacKenzie picked out at a flea market that "was at least 100 years old" in the 1991 remake of Father of the Bride!?! In particular, many of our brides have rings that were designed to look like estate pieces by such designers as Tacori, Ritani, and Daniel K. Although that doesn't necessarily answer the question, does it matter if it was previously owned? 1) "You should happy with any ring you receive!" 2) "I have an estate piece and I love it. As long as it didn't belong to a former girlfriend or wife, it's fine." 3) "Depends on the size of the diamond within the ring." Of course, if you do in fact choose a vintage ring there are some things to consider, such as the cut and quality of the stone, as diamonds were often cut differently back then, as well as the strength in the prongs of the setting. And for what it's worth, even if you do have a brand spanking new ring, there is always the chance that diamond has been used in a different piece of jewelry before it ultimately came your way. So, I pose the question to all you readers. What do you think?